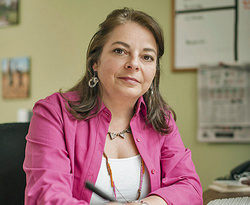 After spending nearly 30 years covering Latin American politics, human rights and humanitarian crises as a journalist for some of the world's leading publications, Sibylla is now advocating for refugees as part of the communications team at UNHCR, the UN Refugee Agency, in Washington, DC. As a journalist she worked and lived in Venezuela, Chile, France the Dominican Republic and Colombia, where she wrote regularly for The Economist, and The Guardian. Her work also appeared in Semana magazine, TIME, World Policy Journal, Foreign Policy, The Washington Post, Americas Quarterly, The Miami Herald, The Houston Chronicle, MSNBC.com, USA Today, The London Times, PODER Magazine, and on National Public Radio. Sibylla is co-editor, with Max Schoening, of Throwing Stones at the Moon (McSweeney's, 2012), a compilation of oral histories from Colombians displaced by violence, part of the Voice of Witness series. She coordinated the production of The Mafia's Shadow in the Americas, a bilingual, multinational investigation on the human rights consequences of organized crime, which was a finalist for the 2013 Daniel Pearl Awards for Outstanding International Investigative Reporting. Sibylla is fully bilingual in English and Spanish and writes in both languages. She is also fluent in French and can get by in Italian. She has traveled extensively in Africa, the Indian subcontinent, and Asia, as well her home turf of Latin America. Sibylla holds a Bachelor of Arts degree in magazine journalism and political science from Syracuse University and studied international relations at the Ecole des Hautes Etudes Internationales in Paris.